Tag: This is a Bad situation for all exposed to the Rad. This is a Bad situation for all exposed to the Rad. 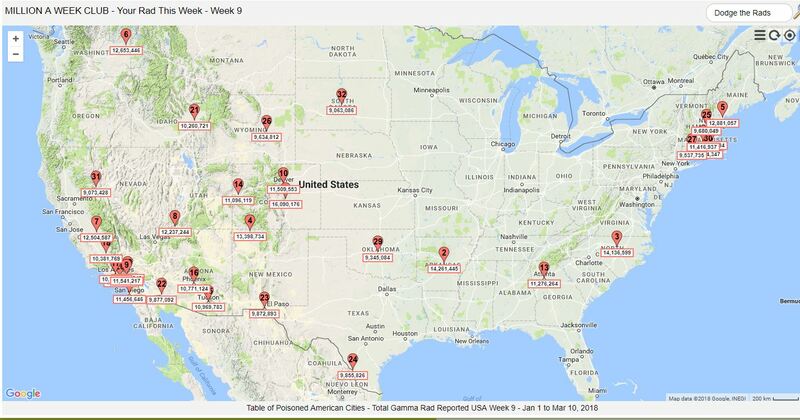 Now included, for the 9th Week of 2018 just passed, all cities above 9,000,000 CPM Year to Date [YTD] of deadly Gamma Radiation and its unpublished radioactive kin. A Count is One Radioactive Decay. PLUS: 64 odd other cities on the Most Poisoned Cities List for Total Gamma Radiation [Recorded] in the US. There were 1,656 Hours from January 1, 2018 to Midnight March 10, 2018. Invariably some of the 135 RadNet radiation monitoring stations fail to file all 1,656 hourly reports. When missing values are calculated using the Average Values YTD method and added to the Recorded Counts the number of affected cities above 9 Million Counts jumps to 47 cities. Again, the missing reports are expected to be filed in the next few weeks. For now, the missing reports are filled in by the average radiation since the first of the year. The radiation counts are recounted from January 1 each week so no late reports will be missed. The remaining cities round out the Total Gamma Radiation List for March 17, 2018. The US Government thinks that nuclear weapons and the huge supportive nuclear industry are required for the national defense. It makes no difference now, though. We’re all dead people walking. It’s been about 73 years now and no person or nation has convinced the US government to change the nuclear policy. Since the reactors leak Rads every day and have since their construction; the nation is long past saving. The Table of Poisoned American Cities is changed. A new Column labeled “Tokyo Equivalent Rads” is added. The acronym is designated TER, the plural is written TERs. One TER is defined as the weekly high nSv/Hour measurement at the Rad monitor in Metropolitan Toneri Park in Tokyo, Japan. The Tokyo nSv/Hour Rad reading gives you an instant and direct comparison of your city to the Rad Monitor in Metropolitan Toneri Park in Tokyo, Japan. All American reporting cities are more radioactive than Metropolitan Toneri Park in Tokyo.